We’d love your help. Let us know what’s wrong with this preview of The Wild Ones by C. Alexander London. Kit, a young raccoon, has lived his whole life under the Big Sky in the comfort of his parents' burrow. But when a pack of hunting dogs destroy his home and kill his parents, Kit finds himself in A When a country raccoon used to a soft life winds up all alone in the big city, there's no telling what he'll do to survive -- and to save his fellow wild animals in the process. and to Mr. Xanders, who made me read them. This first book in a new series, The Wild Ones (Philomel Books an imprint of Penguin Group (USA), August 25, 2015), written by C. Alexander London takes me back to those summer days in an extraordinary new adventure with a young raccoon as the central figure. It's a doorway into a realm of wondrous possibilities. How can you not love a book with animal gangs and a raccoon in a jaunty cap??? From the author of Proxy comes a fantastical story of animals struggling for control of a city. Kit is a young raccoon forced from his home after a seemingly random attack that kills his parents. Struggling to survive in the city, he learns about the turf war between the wild animals, The Wild Ones, and people's pets, The Flealess. He also learns the reason behind his parents' deaths - a reason that dangerous people w How can you not love a book with animal gangs and a raccoon in a jaunty cap??? From the author of Proxy comes a fantastical story of animals struggling for control of a city. Kit is a young raccoon forced from his home after a seemingly random attack that kills his parents. Struggling to survive in the city, he learns about the turf war between the wild animals, The Wild Ones, and people's pets, The Flealess. He also learns the reason behind his parents' deaths - a reason that dangerous people will do anything to keep hidden. This book is lots of fun, and London knows how to tell a great tail, er, tale. THE WILD ONES by C. Alexander London is an enjoyable middle grade adventure fantasy featuring an epic conflict between wild and domesticated animals. House pets known as The Flealess are planning to attack Ankle Snap Alley and break the treaty with The Wild Ones. Kit, a young raccoon in the city for the first time must find the Bone of Contention and stop the turf war. Librarians will find the blend of witty humor with the well-developed animal characters to be a draw for youth who enjoy anthropo THE WILD ONES by C. Alexander London is an enjoyable middle grade adventure fantasy featuring an epic conflict between wild and domesticated animals. Librarians will find the blend of witty humor with the well-developed animal characters to be a draw for youth who enjoy anthropomorphic stories. Fans of Redwall, Warriors, Spirit Animals, or any of the other animal series books will enjoy the diverse cast of animals. A definite "next read" for fans of the Warriors series and a gateway to Redwall. The worlds of the Flealess and the Wild Ones are well drawn, along with their conflict over Ankle Snap Alley. How Kit manages to manipulate things to his benefit, despite being a naive newcomer to this world, will engage readers as much as the different animals we meet (the headlines blurted out by the finches are so funny and the evil of the Rabid Rascals is perfect). Will this be a series? I do hope so. ARC provided A definite "next read" for fans of the Warriors series and a gateway to Redwall. So. I can't believe I found a book about raccoons. I am so excited read this gem! Recommends it for: Proxy fans and people who love seeing intelligent diversity in their books! Another great book by Alex London! Kit, the young racoon, is spending a carefree life under the big sky when one day he is chased by hunting dogs that are working for a dangerous orange cat that wants him distinguished.He is sent by his mother to the Ankle snap valley, which is no better off. the little rock that his parents died for, might be the only way to find the solution to the constant threat of war to the animals of ankle snap valley. Nowhere is safe. There is no one to trust.This one, tiny racoon will have to be the one to save them all. In this moving book there are many similes and metaphors including, “still as stone” as he adventered into the city, “It was brown an notty,like a branch broken off and oak tree” in the dark sewers, “You are a leash lover!” kit insults the gang leader, “I am death destruction, and despair” the crocodile bellows ,and “words were another game to play” There were many elements to this book,. What was liked, and disliked. I liked the cleverness of kit. He always had another answer. I did not enjoy the roughness of the city folk, and the ways they lived by. It was very adventurous and it make you think and predict about what will happen next. Overall I would rank this book a 3 and a half. This is a book to get your mind churning and your body tingling. You never know what is around the corner. This book starts out scary! First, it's the deal between a dog and a cat, and right away, you can tell that these are the bad guys. Then, how Kit becomes an orphan. Then, Kit's arrival in Ankle Snap Alley and meeting its sneaky residents. This book has a great story-line and an amazing plot. And instead of taking over the world, the flealess are trying to take over the ally. And like it said on the back of the book, Kit and his friends might pick your pocket. But they are the best characters I have ever read about about. With good hearts; too good for ankle snap ally. I don't really like how Sixclaw dies. But I think it's a really great story. I would give it four and a half stars, but it won't let me. My 4th grader and I really enjoyed reading this one together and we now need to find book #2! Overall, I enjoyed The Wild Ones. It was fun to dive into this anthropomorphic tale and cheer for Kit as he learned to navigate Ankle Snap Alley, to not trust just anyone, and to make the most out of his life–howl to snap. I give it 4 stars! - I really liked the adventure itself–from Kit leaving the Big Sky to getting mixed up with the Blacktail brothers to searching for the Bone of Contention to the very end. - I liked the friendship between Kit and Eeni. - I’m guessing this might have be Overall, I enjoyed The Wild Ones. It was fun to dive into this anthropomorphic tale and cheer for Kit as he learned to navigate Ankle Snap Alley, to not trust just anyone, and to make the most out of his life–howl to snap. I give it 4 stars! - I’m guessing this might have been because of the age range, but honestly I found it refreshing to read something that lacked a romantic plot/sub-plot. - I enjoyed the names of the characters, especially those that were named based on their appearance or their species. Sixclaw, for example, was a cat with six claws on one of his paws. - I also enjoyed the way the world was portrayed from the animals’ viewpoint. - I thought the exploration of finding one’s community and how a community can be made up of lots of different characters was appropriate. - I thought the need for details and character development was met and quite balanced for readers at the targeted audience age. Enough to tell the story, but not so much that they can’t follow it. - I read an ARC of the book, so sadly I didn’t get the benefit of the beautiful cover or the art inside. - There were times when I thought the book started to sound a little preachy, but perhaps for the age range it is needed more than it might be in a book for an older audience. - I was actually surprised by some of the content of the book in regards to violence/hunting/war/torture/death. While not necessarily bad or bothersome to me, it was just unexpected (perhaps because of my lack of knowledge of the MG genre). Imagine a world where animals have their own society, complete with protection rackets, bakeries, and historians. Kit's parents are archaeologists researching the history of raccoons, and they happen to be raccoons. But it seems that some knowledge is considered dangerous. The "Flealess" or the pets who live with People are trying to find a way to force the wild animals out of the city, even the rundown area known as Ankle Snap Alley. 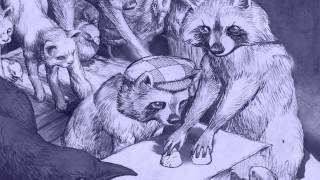 Tradition says that Azban the First Raccoon made a deal with Imagine a world where animals have their own society, complete with protection rackets, bakeries, and historians. Kit's parents are archaeologists researching the history of raccoons, and they happen to be raccoons. But it seems that some knowledge is considered dangerous. The "Flealess" or the pets who live with People are trying to find a way to force the wild animals out of the city, even the rundown area known as Ankle Snap Alley. Tradition says that Azban the First Raccoon made a deal with Brutus the Duke of Dogs guaranteeing the wild animals the right to stay in Ankle Snap Alley and that the agreement is recorded on the Bone of Contention. When Flealess sources find out that Kit's parents may have found a clue to the Bone's whereabouts, they will do anything to stop the Bone from being found and the agreement honored. Suddenly Kit goes from being a carefree youngster in the wild to carrying out a mission in the city to find his Uncle Rik and get his help in recovering the Bone. The characterizations of the various animals are entertaining and play into their motivation for their actions. There are the church mice trying to bring everyone together in peace. The retired fighting rooster (with his gorgeous feathers) who runs a barber shop. The sneaky raccoons running a shell game for gullible types. The finches who shout out the news and the hens who sit and gossip. It's all very lively and makes the intolerance of the house pets seem very shallow and narrow-minded. For fans who enjoy Guardians of Ga'Hoole, The Warriors, or The Tale of Despereaux, this is another animal tale that packs a punch of intrigue, danger, and action. There are characters to cheer for and others you wish would get what they deserve. Kit and his allies fight the good fight on behalf of their community with courage and tenacity.